Maspalomas sand dunes - Gran Canaria | About various things! I walked rather shyly on the golden sand of the Maspalomas dunes, scared by the thought that it was just a mirage in a desert and, to the slightest touch, everything could disappear. There was well past the midday hours when I woke up in front of a spectacular view of nature that seemed to open a giant geographic atlas, and I was about to enter the story. I sank my feet into the hot sand, then bravely headed for the direction the sun was preparing for rest. For several hours I was a spectator, a child, a hero, and an actor in some scenes that man’s skillful hands can not accomplish. It was a pity to wake up at 5:30 in the morning after a long evening I spent on the streets of the capital of Tenerife, celebrating the Santa Cruz Carnival, which I wrote about here. At 7:30 we had to get to the port because at 8:00 the ferry was going to leave Tenerife and take us to the port of Las Nieves in Agaete, Gran Canaria, another beautiful island. 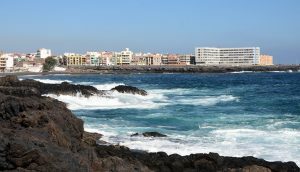 We had rented the car two days ago from Tenerife South Airport and we thought it would not hurt a two-week walk through the Canary Islands. So we got into the car and drove to the port of Santa Cruz. 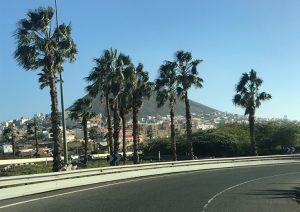 To get from Tenerife to Gran Canaria, you can opt for plane and in 30 minutes you get to Las Palmas, the capital of Gran Canaria, and the price is lower than if you want the ferry. 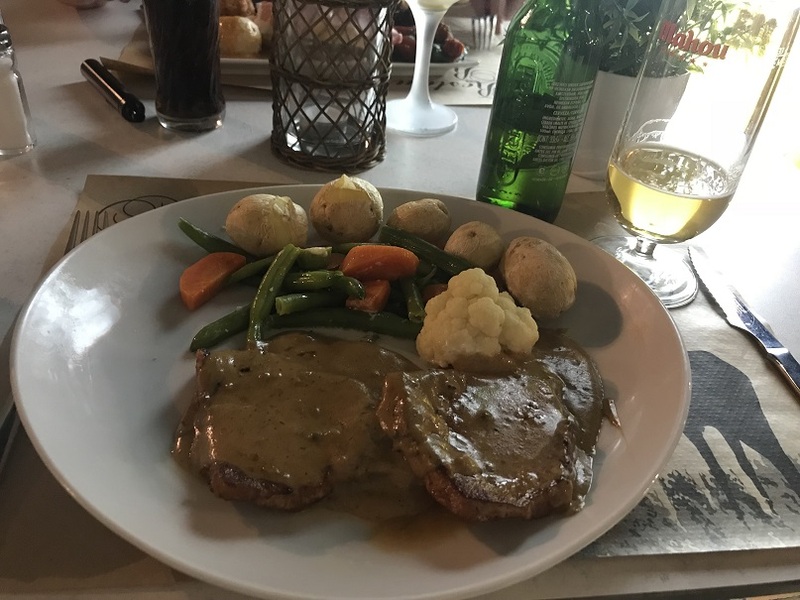 We opted for Fred Olsen, the company linking the two islands, wanting to take the car with us so we can move freely anywhere and not be conditioned by the means of transport or taxis. The price I paid for a pass, returned / two people plus the car, was 181 Euros. It is not at all cheap, but these are the prices for tourists, I have learned from some locals that for them the prices are much lower. 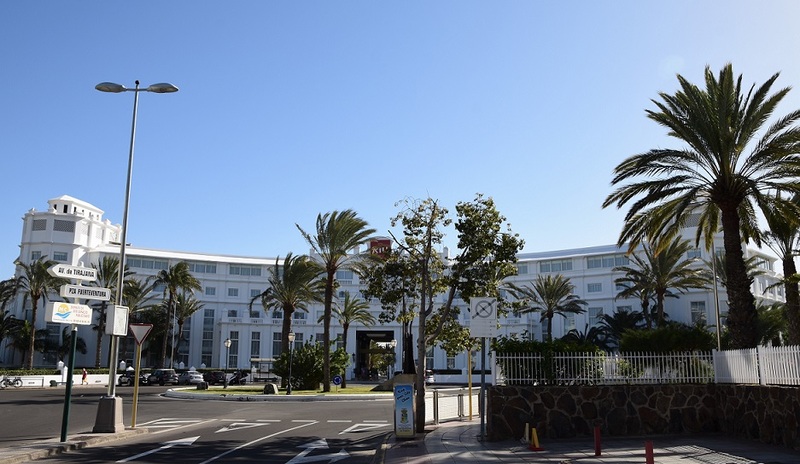 Fred Olsen departing from Tenerife to Gran Canaria are frequent flights every two hours, and the conditions they offer during the 80 minutes of the race are the best. 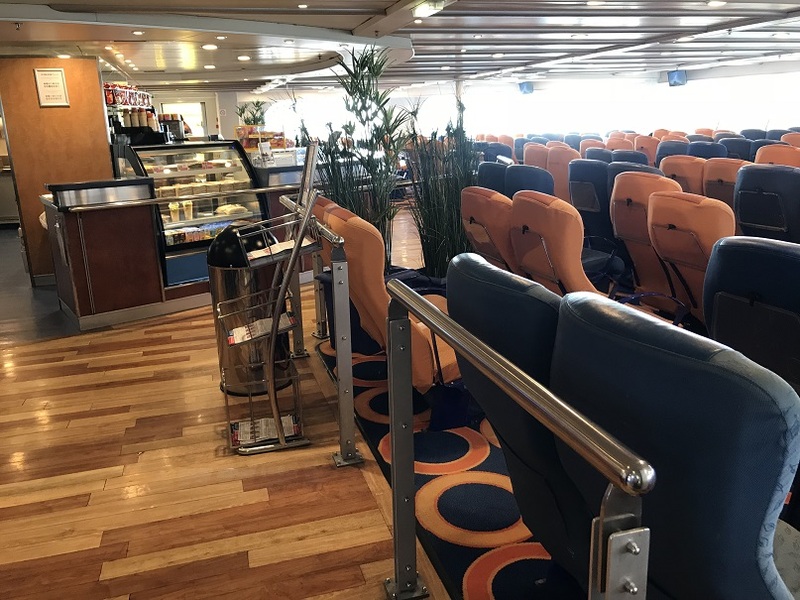 Comfortable and generous chairs, monitors for short movies about the Canary Island, two restaurants where you can buy coffee, sandwiches, desert or different juices, a smoker’s place, all of which are offered in a clean room and with modern décor. 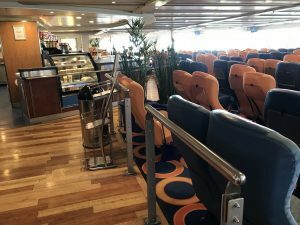 The time spent on the ferry passed quickly, accompanied by good coffee and the ocean that crawled beyond the windows, nor did we know that we were approaching Gran Canaria, the island just 200 km from the West Coast of Africa. It is amazing to see the very small island from far away and, as you approach, the huge footprints of the volcanic lava open up in front of you. 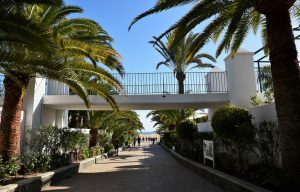 We drove down to the car and in just a few minutes we wre on our way to Playa del Ingles, the city on the southern coast of Gran Canaria, where we could get to the sand dunes of Maspalomas very quickly, the island’s biggest attraction . But as there was another objective on our way, we made a detour for about two hours 🙂 and we went to see Bufadero from Garita, near Telde. 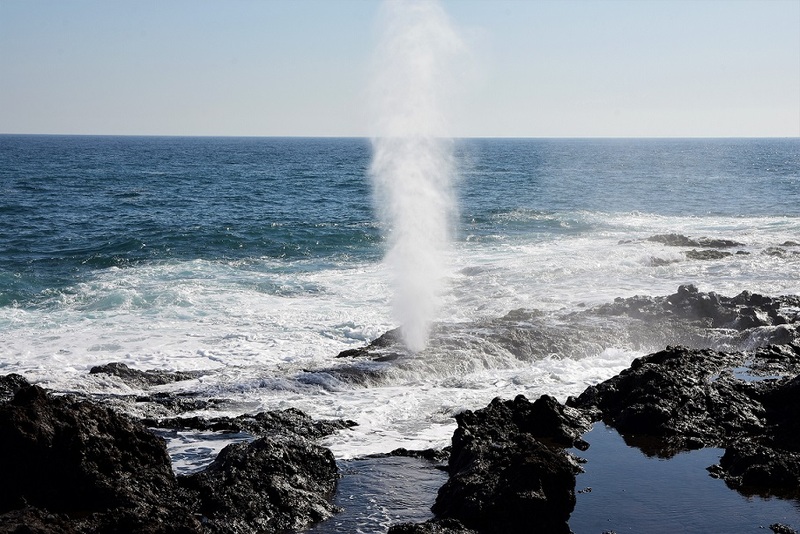 It is a cliff area on the Atlantic Ocean, where the lava gave birth to a deep formation, a kind of ocean too deep 🙂 The boiling waves hide in this recess and blow outward through strong jets. It was a show I did not want to go away from, all the more so since I never imagined there could be such a thing. Pretty close to Garita’s Bufadero is Playa del Hombre, a pretty and beautiful beach, which we walked a short walk to the oceanfront. Some locals were at the beach, others were surfing surfboards, and most of them occupied all the places on a terrace near the beach and where we would have liked to eat a pizza 🙂 We did not find a free place so we returned to where we parked, near Garita’s Bufadero. We have admired for a few more minutes the jets of water that were threatening blowed to the sky, then back in the car and went to Playa del Ingles. With some fear, we left our stuff in the room and we went to discover the city. 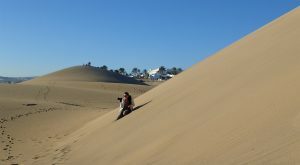 Our intention was to get to the sand dunes near the sunset, to enjoy the divine colors naturally projected on the earth. The road to dunes runs through the city and is not very short, it took us an hour to get close to the “desert”. We still had enough time until dusk, so we randomly chose a street and when we got to the end of it, we had a huge surprise. We were on a hill at the base of which was a splendid golf course full of palm trees and other exotic trees, in the distance a very cozy cottage neighborhood, and the ocean and sand dunes to which it was supposed we get 🙂 The image was an unrealistic one: rich vegetation and elegant houses, following which the sand dunes opened, all ending with the ocean line. 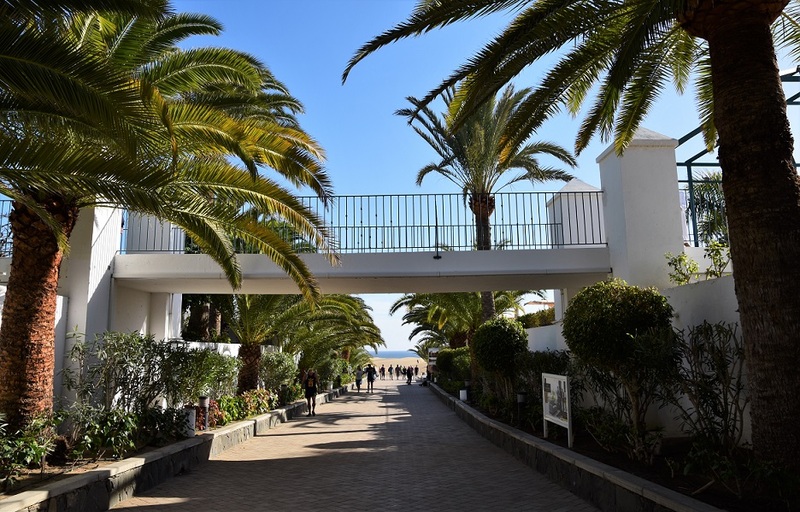 We continued on to Maspalomas and, among reproaches like the one I told you to take a taxi, I heard: we arrived! I did not understand where we arrived, I thought it was hallucinating from the heat, being about 4:00 PM 🙂 To our left was the ocean as we had known it since we left the hotel, to the right were terraces, restaurants and houses like the ones in magazines, and in front was the Riu Palace Maspalomas Hotel, not to say that we were coming from the back 🙂 So… no trace of dunes. We drove down a short alley and came to a stone wall that separated the dream of the reality. Beyond that not very tall wall, which was a place of benches, the world of sand dunes opened. 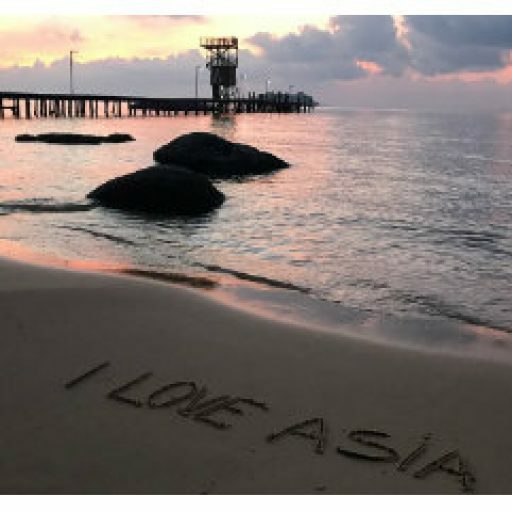 I enjoyed myself just like a child who saw the sea for the first time. While Dan was dealing with earthly things and was looking for cold beers, I sat down on the stone wall and wondered if what I saw was reality or fever. 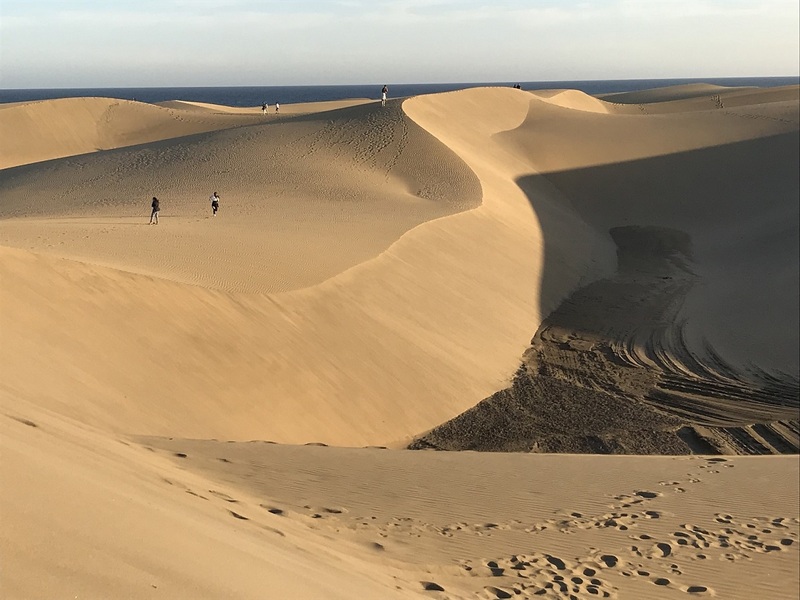 It may have seemed incredible, but I refused to put my feet on the sand and I wanted to go into the story first: the story of the golden sand dunes from Maspalomas. God, how beautiful is the place! 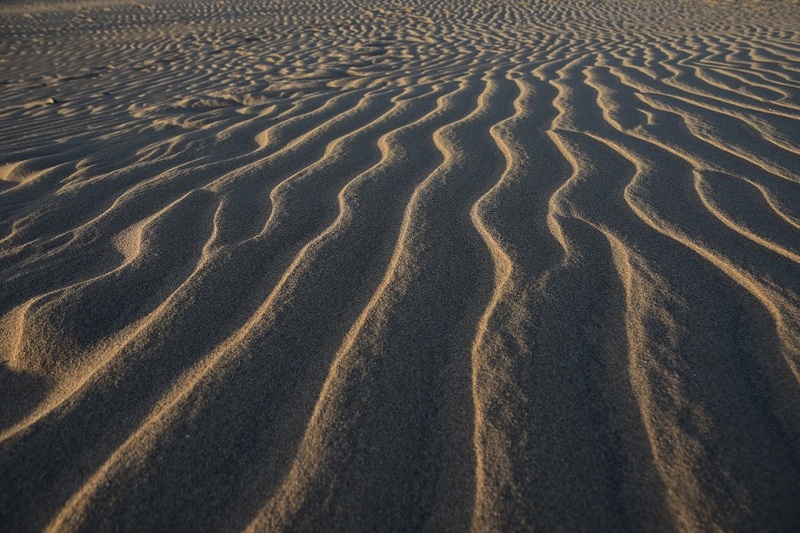 Sand dunes, as you see left and right, watched closely by the Atlantic Ocean. It’s divine! In my mind, reality is confused with the dream: sorbing cold beer in a box and imagining camels carrying princes and princesses in a perfect string that led to a palace. 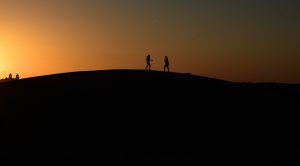 At a close look, we saw that people like us had taken the place of princes and strolled quietly among the dunes, all waiting for the glorious sunset. 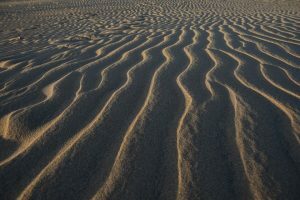 The sand was still hot when the sun was showing signs of fatigue, and we thought it was time to discover the dunes. 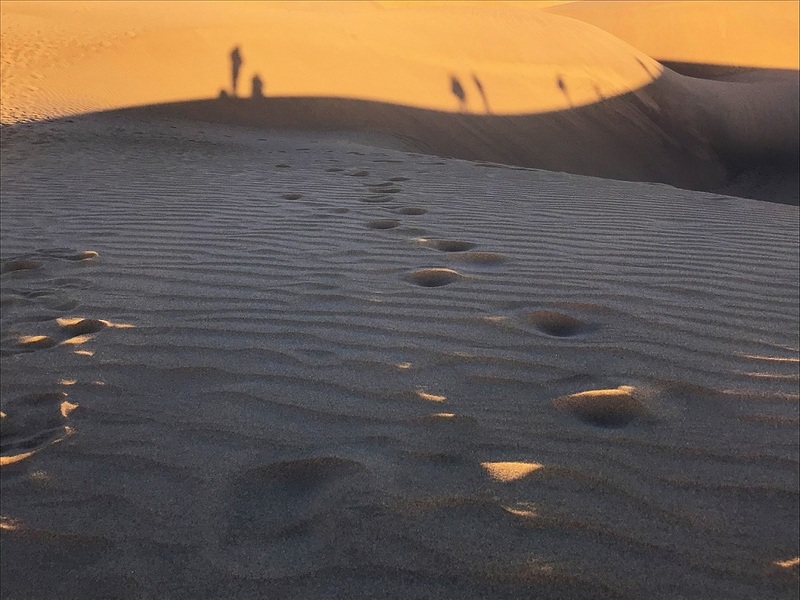 We have been waiting for this for a very long time, even if a few years ago we were in an Arab country in the Sahara Desert, we had not experienced the experience of sand dunes. The perimeter of Maspalomas is quite large, about 400 hectares and is declared a national park. 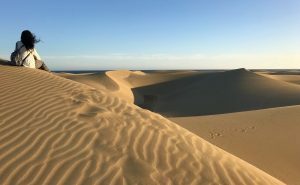 Being a very large area, and we were quite tired, we did not take much away from the starting point, but enough to see only the sand hills around us. I ran in the winding rhythm of the dance of winds and I layed on the sand trying to listen to the ocean. The show was completely at sunset, when the unreal colors overwhelmed the earth, casting shadows over the orange light passing through the sand. 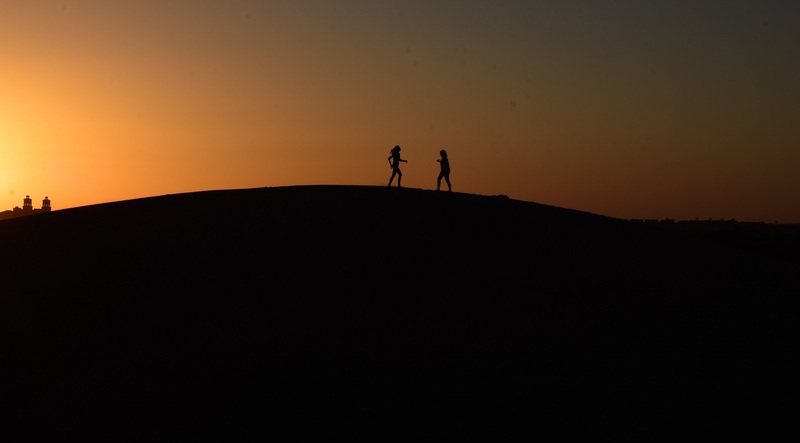 Several young people were playing on another dune in front of us, and I was glad to photograph their silhouettes and shadows. As it started to get cold, the sand suddenly cooled, and we began to feel our feet getting colder. With sand in hair, pockets, glasses, backpack, and … the saddest … on the camera lens, we left the “desert” and returned to the Riu Hotel, the gateway to the city. 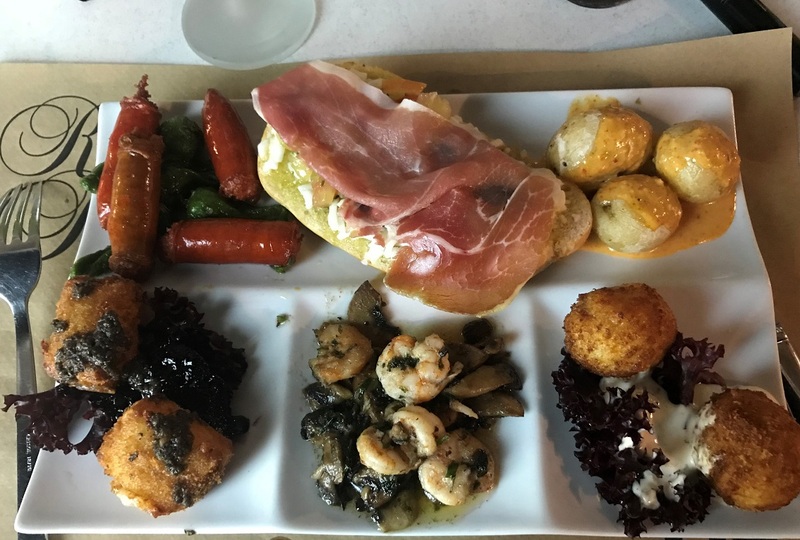 We were already cold and hungry, so we stopped at a restaurant that had a terrace and ordered some food: he tapas, I lomo cerdo flam … what went out see in pictures 🙂 The price… 42 Euros. We finished the evening by admiring the city lights on the balcony of our room and thinking about the news that will be revealed to us the next day in Gran Canaria. Until next time I hug you dearly and I leave you with more pictures here. Puerto de Mogan - the flower village | About various things!